When you hear the word “uprooting,” what do you think of? Maybe pulling up weeds or transplanting flowers? If people are uprooted, is that a good thing or a bad thing? I guess that all depends on your perspective and your faith. I’m filled with equal parts excitement and dread. While I’m looking forward to this new adventure, I’m not always happily or gracefully packing up a life I love here. So I’m looking for signs of hope and words of reassurance wherever I can find them. As my husband and I work to declutter our home to get it ready to sell, we’re moving lots of little treasures out of the house. 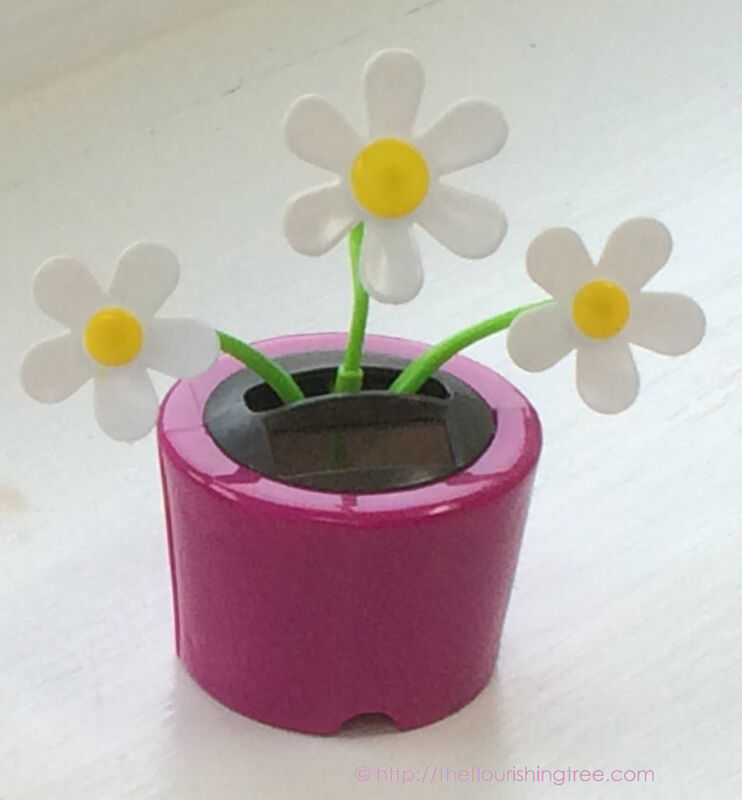 About a year ago (maybe longer given how quickly time flies), he brought home three little gifts for me: solar-powered plastic flowers that wave in the sunlight. He’s adorable that way. I set them in a sunny window and waited for them to start waving. The blue one started. The red one started. The purple one … well, it didn’t start. Even after I set it out in direct sunlight for a bit, it still didn’t wave. I don’t know why I didn’t throw it away, but it sat next to the other two, never budging all this time. Wow! I’m not one to overuse exclamation points as a general rule, but wow!!! I never thought plastic solar flowers could amaze and delight me so much. You see, all that little flower needed was a road trip—a bit of shaking up and uprooting—before it could thrive. And maybe if that’s true of a little plastic flower, it can be true of me, too. I can thrive in a new place, uprooted, shaken up, in an unfamiliar sunny spot. Those little plastic flowers are a comfort to me now in the moments I get panicky about moving away. Back in March, I wrote a post called The big push. I know Richard Rohr didn’t write the words I quoted in there just for me, but they comfort me even more than the little plastic flowers. God is giving me a big push. I’ll be honest: some days it feels like a bully’s shove. But I have hope and reassurance that God is going with me and dreaming a California dream for me that I never imagined for myself. A.A. Milne, creator of Winnie the Pooh, wrote, “You can’t stay in your corner of the Forest waiting for others to come to you. You have to go to them sometimes.” I’ll be leaving my little corner of the forest soon, and I’m looking forward to meeting those who needed me to come to them out in California. I’m trusting the uprooting will bring a wonderful change. How about you? What ways has life surprised and pushed you? I’d love to hear your uprooting stories in the comments below. This entry was posted in flourishing tree and tagged big push, California, home, hope, moving, new adventures, North Carolina, plastic solar flowers, reassurance, Richard Rohr, roots, small gifts, transplants, uprooting by hopesquires. Bookmark the permalink. Wow, indeed! This is so like God–to give you a visual aid for his message to you. And yet, the phenomenal timing and juxtaposition of experiences like your purple solar flowers’s awakening road trip just before your own major road trip always shock me. I think God does this more often than most of us notice. He is no doubt delighted that you caught this one. What a good eye you have, Hope! When will you go? God has definitely reminded me that I won’t be going to this new place all the way across the country by myself. I’m looking forward to seeing what God has in store for C and me out there. I like your plastic flowers. Uprooting is hard. Love to you! Wow! I guess it’s official. I’m sad but excited for you. I will look forward to following along with your journey, but will miss our coffee and lunch dates. It’s official, and both sad and exciting, but I look forward to keeping up with you virtually and seeing you when I can when we come back to visit. I can sit and watch my flower too that a friend gave me, I think of how she and her husband has shown me so much Christian love this past year. I have been pushed out of my comfort zone becoming a group leader for Bible Study Fellowship. I have been in leadership but behind the scenes the way I prefer – but God knew I was getting a bit too comfortable. After accepting and going to our workshop – it feels so right. God not only up rooted me He pushed my new roots forward to blossom like I never imagined. Patty — thanks for sharing this. What a lovely testimony of how God pushed you so you could blossom in a way you might not otherwise have done on your own. Thanks for the encouragement. I’m sure you’re a blessing to those you lead in BSF! Thank you – Gods grace and strength for sure! Love the solar flowers and the story they whispered to your heart. I will follow you along the way but will miss being in the same city together. Hugs. Thanks, sweet friend! We’re keeping roots here, too, and so I anticipate as many visits as possible back here. Just not sure how often that will be. I love the way your little solar flowers spoke into your situation! Uprootings have often been times of amazing growth for me…going to and graduating from college, changing jobs, etc. Sometimes it wasn’t a physical move, but letting go of an old idea. Great things await you in California! Thanks, Beverly! I know this will be an exciting adventure (even if there are days that I wonder why the uprooting has to be so darn hard).